The company was founded in 1979 by Greg Paul and his wife, Tamera, with the vision of representing growers and customers. Our goal was simple; treat both parties fair. Sell the product for the right price mutually benefiting both the grower and receiver. Greg grew up in the farming industry. His grandfather grew seed potatoes in Guadalupe which is located in the Santa Maria Valley in California. His father managed a farming company, with its main focus on potatoes, for Em. H. Mettler and Sons in Shafter, California. Greg started working in the fields at 12 years old moving irrigation pipe, planting potatoes, working in the equipment shop during the winter months and the packing shed during the summer. 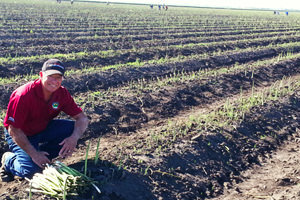 After graduation from Cal Poly San Luis Obispo, Greg worked in many aspects of the agriculture industry, including managing a farm in Edison, California for Johnston Farms. In 1973 Ed Mallett, president of E.M. Mallett Inc., gave Greg his first opportunity to sell potatoes and onions. He traveled from California to South Texas and Blythe, California selling onions and sold potatoes in the Stockton Delta. In 1976, he went to work for Belridge Farms where he sold many products including carrots, citrus, and mixed vegetables. He was named Assistant Sales Manager in 1978. In 1979, an opportunity arose to form our own company and represent a major potato grower in the Stockton Delta. He sold The Huey Brothers potatoes until they retired in 1989. Their labels were well known in the industry; JHJ and Red Dragon. Red Dragon is still being packed today. The Company went on to represent many growers in California including D’arrigo Bros. Company of California, Herb Speckman Farms, General Potato and Onion, The Scarrone Family, CCRC Farms, Beldrige Farms, Jimmy Chavez, Albert Fonseca, Sam DeLuca, J & A Solari and Klein Family Farms. Today, Greg Paul Produce Sales, Inc., has four employees, including Greg and Tamera Paul, their son, James Paul, and Greg’s sister, Susan Oliveira. This company was built on family and a hard work ethic and has continued that tradition for 35 years now. They now represent Klein Family Farms with the Delta Queen label for asparagus and Delta Queen, Delta King, and Pintail labels for red, white and yukon gold potatoes; and J & A Solari asparagus with the Clements Ranch label. Greg Paul Produce takes pride in the service they provide to not only their growers, but to their customers as well. Employees are on sight at the packing facilities overseeing harvesting, packing, shipping, and food safety. Delivering a safe and tasty product is a priority and they look forward to continuing the relationships that have been established with growers and customers and look forward to meeting and serving future growers and customers.